I will full fill this digital paper leaves with words to explain why are we talking now and how it has surpassed all my expectations and hopes. 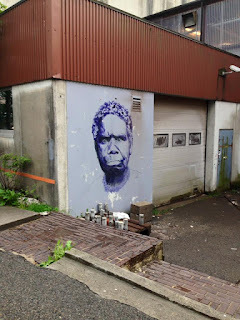 Truganini is my first work in the street ever and my first large painting. I painted it on December 2014 in the context of an auction for Palestine that took place at BAS (The Bergen School of Architecture). I was collaborating on the production of the event with BART, a street art company, already dissappeared, that was the organizer. Almost in the last moment, they invited me to paint outside the building. My first opportunity in the public space. I moved to Bergen on July of this same year. I am not norwegian, I'm from a city called Pamplona-Iruña in Spain, I'm basque. I'm artist and part time waitress. I used to live in Barcelona and came to Bergen with my partner on 2014 because his job. As a new person in a new country I tried to catch around anything that could interest me. With this attitude I met Naeem Searle, one of the partners of BART. They were painting a large wall with RC, and I thought it might be great to paint outside. I started to collaborate with Naeem who became a very good friend and who introduced me to the street art. One year before moving to Bergen, my partner gave me a book for my birthday: “Guns, Germs and Steel: Brief history of the humanity on the last 13000 years” by Jared Diamond. Because of this book I started thinking about how could I make an homage to those societies that have been indistinctively murdered until the the last single person, in a very brief period. I wanted to make something clear and direct, simplifying as much as I could the concept. With the explanations of this book I understood the recollection/hunting vs production of aliments as the first factor of differences on opportunities on the first contact moment between societies. 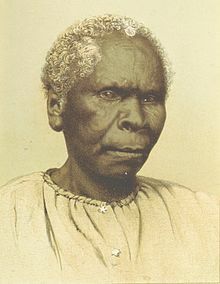 To symbolize these genocides I took two images that were in the book, one of Truganini from Tasmania and the other of Chaticks si Chaticks chief from North-America. Both with a very deep and powerful gaze. The idea was to make vandyke prints (old photographic technique) on fruit boxes and sacks with their portraits. Unfortunately, I couldn’t finish this project but I printed them on paper using the same technique. When I started working with Naeem I showed him Truganini’s picture and when they asked me to paint at BAS he told me “Why don’t you paint Truganini?” That was a very good solution for my unfinished project! I had two days to paint it and I really wanted to make a respectful portrait; my skills with spray cans were almost unexistent so I took brushes and sponge. I worked on it on the rain of Bergen’s December (short day light and pretty cold, painting with gloves). There were not too many colours to choose betwen for outside wall painting so I improvized. I used purple paint and ink. Even if was kind of casuality, this purple colour relates it to feminism, women power. From the very first moment I felt Truganini as an icon and that was my homage. It aims to make her part of the collective memory. What we should never forget. It is still there and nobody tagged it. I couldn’t imagine that it would arrive to Tasmania or Australia. To her people. That completes the circle.